Say hello to Dave, the largest earthworm ever discovered in Britain. This ridiculously long specimen of the common earthworm (Lumbricus terrestris) was discovered by Paul Rees of Widness, UK, who spotted the 15 3/4 inch-long (40 cm) behemoth in his veggie garden. His stepson, George, named it Dave. Knowing he had found something rather extraordinary, Rees delivered Dave to Emma Sherlock, a scientist at the Natural Museum of History. How wonderful that she compared it’s weight to a chocolate bar. 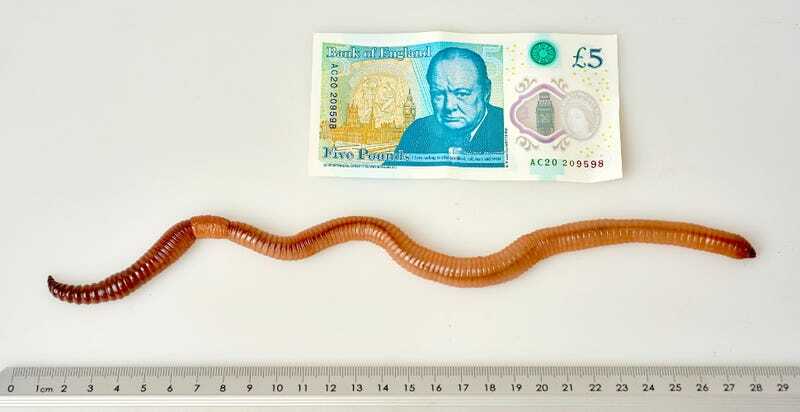 Anyway, the worm weighed in at 26 grams (0.92 ounces), which absolutely destroys the previous record for the UK—a 15 gram (0.53 ounce) earthworm discovered in Scotland just last year. Worms the size of Dave are rare because the larger they get, the more likely they are to become some animal’s meal. What’s more, the garden that Dave lived in must have been incredibly fertile and well-drained, with decaying matter quickly recycled back into the soil. The good news, however, is that Dave will be preserved in a jar at the Natural History Museum for all time. So tweeters calm down.